Our rose gold wedding bands: Our rose gold rings are made of a beautiful alloy of gold and copper - there is no such thing as 'pure rose gold'. It became popular at the start of the 19th century, especially in Russia; which has lead to it being occasionally referred to as 'Russian gold', as well as sometimes being termed 'pink gold' or 'red gold'. Technically, though, red gold, pink gold and rose gold are different things, as they contain different proportions of copper. of the 19th century, particularly in Russia"
Components of rose gold: The 'purest' form that rose gold can come in is 18ct - this contains 75% gold with the rest being mostly copper and perhaps a small percentage of silver. The exact proportions of each metal can depend slightly on which supplier we use, and many suppliers keep their percentages to themselves as a trade secret. 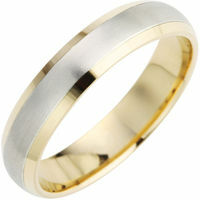 We also sell wedding rings in 10ct rose gold, which means 41.7% of the metal is gold. You can browse our range of rose gold rings here, as well as our range of Welsh gold wedding bands, of which the ones made of both rose and yellow gold are favorites amongst our customers.